A stew is a dish cooked for a long time, and served in the gravy produced by the cooking. The basic materials may be any meat and/or vegetables. It is ideal for tough meat like mutton and beef cuts which have marbling (fat) and connective tissue. Also, the tougher vegetables should be used. It is traditional to start off with a simple sauce, such as a roux. Even simpler, flour and an Oxo stock cube can be stirred in some milk and water. It is usual for the tougher meats to start off by themselves, with vegetables added later. Casseroles and stews are similar. Casseroles often have a topping; stews do not. Stewing is a cooking process whereby heat is applied to the bottom of the cooking vessel (typically over a fire or on a stove), whereas casserole cooking is generally baked in an oven where heat circulates all around the cooking vessel. Stews have been made since ancient times. It figures in the Roman cookbook by Apicius. Herodotus says that the Scythians (8th to 4th centuries BC) "put the flesh into an animal's paunch, mix water with it, and boil it like that over the bone fire. The bones burn very well, and the paunch easily contains all the meat once it has been stripped off. In this way an ox, or any other sacrificial beast, is ingeniously made to boil itself." Amazonian tribes used the shells of turtles as vessels, boiling the entrails of the turtle and various other ingredients in them. Other cultures used the shells of large mollusks (clams etc.) to boil foods in. There is archaeological evidence of these practices going back 8,000 years or more. There are recipes for lamb stews and fish stews in the Roman cookery book Apicius, believed to date from the 4th century AD. 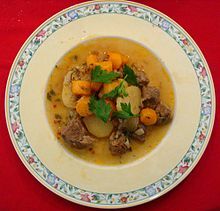 Le Viandier, one of the oldest cookbooks in French, written by the French chef known as Taillevent, has ragouts or stews of various types in it. Hungarian goulash dates back to the 9th century Magyar shepherds of the area, before the existence of Hungary. Paprika was added in the 18th century. The first written reference to 'Irish stew' is in Byron's "The Devil's Drive" (1814): "The Devil ... dined on ... a rebel or so in an Irish stew." ↑ Grainger, Sally 2006. Cooking Apicius: Roman recipes for today. Totnes: Prospect Books.